McDonald's is possibly the world's most famous fast food brand, but until recently it was almost impossible to find on the motorway network. Now it is common both on and off the motorway, almost always open 24 hours, and taking the majority of the trade everywhere it is built. Roadchef announced in September 2012 that over the next few years they would roll out McDonald's to all their sites, replacing The Burger Company. By summer 2016, all Roadchef sites except Bothwell included a McDonald's, and their McDonald's offer outperforms almost every other Roadchef facility put together. As part of their arrangement, they removed their name from the road signs and signposted themselves as 'McDonald's Costa', creating a similar set up to what is now used at Blackburn and Cullompton. Throughout the 2010s, McDonald's have been refurbishing all their restaurants, including franchised ones. For services, this replaced their sometimes dinghy units with wide and open dining areas with touch-screen ordering. This style has been adopted by Burger King and KFC in recent years. For many, McDonald's is popular because the prices charged at a service station will be similar to those charged on the High Street. In 1992, after the service station planning process was deregulated, McDonald's indicated they would be building their own services. They eventually did this at Blackburn, and were signed as the owner of Cullompton. When the first McDonald's at a Welcome Break opened in 1995, they said that they were going to build one at all 26 of their sites. This process was stopped after just two because Welcome Break were bought by Granada who insisted that every one of their services had a Burger King. Today, Welcome Break and Granada have split and whilst the two McDonald's still remain, no more have been built at Welcome Breaks and instead KFC was rolled out. Next, Roadchef trialled McDonald's, but decided to change them to Wimpy in 2001. These units were all operated directly by McDonald's, because McDonald's were apparently very difficult to negotiate a franchise arrangement with. The newest agreement with Roadchef is a franchise agreement. In Ireland, Topaz are building McDonald's drive thrus at their new services. 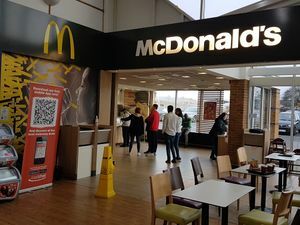 McDonald's restaurants can be found at many A-road services. Almost all are open 24 hours and have drive thrus - though a map of drive thrus only is available.